The new report by DORA on the state of DevOps in 2018 found outsourcing to be the crutch of low software delivery performers. The DevOps Research and Assessment (DORA), which is a collaborative effort between DevOps experts Dr. Nicole Forsgren, Gene Kim, and Jez Humble, has released its 2018 State of DevOps report. This report is released annually and is in its fifth year. The researchers use cluster analysis, which allows readers to compare their performance to their rubric of software delivery performance, which categorizes performers as elite, high, medium, and low. This year the report looked at the outsourcing of IT and software delivery functions, among other metrics, and how it affected software delivery performance. The survey showed that functional outsourcing (one role as opposed to an entire process) had a negative impact on performance. “Low-performing teams are 3.9 times more likely to use functional outsourcing (overall) than elite performance teams, and 3.2 times more likely to use outsourcing of any of the following functions: application development, IT operations work, or testing and QA. This suggests that outsourcing by function is rarely adopted by elite performers. ” — Accelerate: State of DevOps report. “[Functional outsourcing has] been a common barrier to the adoption of DevOps,” says Jez Humble, CTO and founder of DORA. “We see teams all the time [say], ‘We’d like to do DevOps, but we have functional outsourcing…so it’s impossible to collaborate,’” says Humble, adding that he was glad to see that what they are hearing in the field was strongly confirmed in the data. According to the report, one reason why outsourcing negatively affects software delivery and operational performance (SDO) is that outsourcing often results in batch software updates, which can lead to longer lead times. When high-value features are batched with low-value features, there can be significant costs to the business. The report provides an example from shipping company, Maersk Line. The top three features had a cost of delay of around $7 million per week or $30 million per month. At that rate, the cost to delay features would pale in comparison to the cost savings of outsourcing. The expectation of simple experiences along with the preference of mobile devices is changing what consumers and businesses expect and need. While functional outsourcing does seem to have a significant negative outcome on SDO, it’s not the only factor that impacts SDO. For example, the research also found that the way cloud infrastructure is implemented also had an impact. According to NIST, and as documented in the report, there are five essential characteristics of cloud computing: on-demand self-service, broad network access, resource pooling, rapid elasticity, measured service. “Even though over 80% of people said they were using cloud, only 22% of respondents said they were met all five of these essential characteristics, and then when we do the math on it, we found that if you meet all of those [cloud] characteristics, you’re 23 times more likely to be in elite performance group,” says Humble. One more key takeaway from the report was that the research showed that high performance is not only for the small, nimble, and unregulated industries. It’s industry- and company-size agnostic. “Anyone can do this,” this being high software delivery performance, says Humble. “We find highly regulated, big companies in our high performers, we find small non-regulated companies in our low performers. We don’t find any statistically significant difference between different verticals on software delivery performance,” says Humble, although he adds that it is hard work. But there is always one proviso and that is the company must live that mantra at every single touch-point, day in and day out. Consistency is key. For example, on the Eir website I found this: “Everything we do is built around our customers. You’re an essential part of our vision of a brighter, modern and more dynamic future together”. This is what Eir claim they do today. If you’ve had any contact with Eir over the years, you can decide if it lives up to this promise. Now I know that’s tough and delivering perfect consistency is a Holy Grail for most. Even the great Superquinn back in the day, suffered occasionally from out-of-stocks which of course annoyed some customers. But we know that the culture in Superquinn that drove this agenda, came from the top and delivering consistently great customer experience was core to the business. When Hidden Hearing embarked on a culture-change programme in 2015, it put the patient at the heart of all decision-making. Processes changed, resources were beefed up where necessary, internal and external communications changed and most of all, the behaviours of its people were recalibrated. Obstacles to becoming a customer/patient were identified and efforts made to eliminate those obstacles. For example, the 30-day refund policy was extended to 90 days. Warranties were increased from two to four years. A patient can now get free batteries for the life of the device and Hidden Hearing will keep talking to patients every few months to re-adjust devices for free. But they have to find those customers in the first place. The marketing business model is designed to pull big numbers of relevant people into a funnel. When those customers engage they become part of the CRM system and are contacted by the contact centre to make an appointment for a free consultation. This is where a gap emerged. Because of the specialism involved in running a contact centre, which includes high-tech telephony, IT systems, data reports and skilled people, Hidden Hearing outsourced this service. After some time, service levels dropped and so did sales. Managing director Stephen Leddy is rightly very protective of the brand DNA, as articulated through the mission and values. The evidence was that customers were not getting the quality of care and attention at this critical first point of contact. “Simply put, the contact centre just wasn’t ‘on-brand’,” he said. At considerable capex and ongoing operating cost, the contact centre is now a fully functioning department in its Citywest head office, fully integrated and managed by the management team. The decision was taken to bring it back in-house so that the company can control it fully and ensure a seamless customer experience at all touch points. 1 Is outsourcing appropriate? If the project requires a specialist set of skills, technology or capex that is not within your current parameters, then outsourcing is worth considering. 2 Build a plan with clear metrics: Be very clear on what your objectives are, what is essential and what is desirable, and what are the measures of success. This will enable a proposed partner to bid effectively and agree a strong service level agreement (SLA). 3 Select a provider that can deliver on your brand promise: The partner should take time to really understand your business and display that they have similar values to you. They should illustrate how they will integrate seamlessly with your people and your customers. 4 Don’t let price be the main criteria: The adage, ‘buy cheap, buy twice’ will show its ugly head here if you select a partner on price only. I saw it with an in-house caterer who won the bid on price alone. Within weeks, the morale of the workforce dropped dramatically. Be sure the metrics in the SLA also reflect qualitative measures such as customer feedback, etc. 5 Get a dedicated team: If the provider insists on being able to rotate their own people across different organisations to cover peak trading times, watch out. This may enable the provider to manage their own costs, but not without risk to the quality of the service. 6 Communicate regularly: Don’t let time zones or language prevent regular, structured and effective communications. Clear metrics and flashy reports are not enough. There is nothing to beat sitting down on a regular basis and chatting through the detail. Continue to own your own project. Turning now to the service provider: You may be a contact centre, logistics provider, caterer, R&D specialist, contractor, IT or HR practice providing services to your clients. But if you are not offering a seamless service both to your clients and their customers, cracks will show eventually. Customer experience in my view, is becoming the next great battleground for business. As a service provider you already know the steps outlined above. But as the market continues to change, the need for seamless integration with your client has never been more acute. Alan’s debut book ‘Premium is the New Black’ will be launched in October. Independent analyst firm, rpa2ai has released RPA50™, the first in a series of in-depth research reports on Robotic Process Automation (RPA). RPA50™ is the industry’s most comprehensive listing of RPA vendors to-date. The RPA50™ infographic lists the top 50 global vendors within the Robotic Process Automation (RPA) marketplace. It also identifies eight different vendor categories and provides guidance on when to consider which category of vendors. In addition to vendor summaries, the research analyzes the RPA ecosystem and marketplace development, examines the impact of RPA, highlights implementation challenges and the role of professional services. RPA has a greater potential to significantly automate and change the work of millions of white collar professionals than Artificial Intelligence (AI). The RPA marketplace is attracting a significant amount of venture capital investment, enterprise attention and employee anxiety. While it can be an effective way to improve efficiencies and processes, RPA is regularly mis-sold as Machine Learning (ML) or Artificial Intelligence enabled. In reality, most RPA products have little to no ML or AI capabilities. RPA products vary widely in their provenance, functionality, architecture, deployment options and geographic footprint. One size does not fit all. Business buyers are often avoiding and not involving IT in their decision making processes – resulting in failed implementations. “RPA is more of art, than science today,” says Alan Pelz-Sharpe, strategic advisor to rpa2ai, and adds, “aspects such as differing cultures, current state and the tech stacks can be major drivers for success of RPA initiatives. If there is one area that Robotics Process Outsourcing affected widely is near and offshore jobs. Robotic process automation (RPA) is applied to a variety of business processes by automating rule-based monotonous tasks and bridging temporary gaps. Basically, the RPA engines are loaded with highly-specific process knowledge which enables rules-based automation. Today, robotics lifecycle is automating almost half the traditional back-office functions which are being augmented with automation and are offsetting the cost of locations, noted a Deloitte Financial Services paper. So far, the early stages of adoption have shown businesses great benefits. According to recent statistics, robotic automation market will reach $4.98 billion globally and is forecasted to grow at a rate of 60.5 percent. So, how is RPA a threat to the BPO industry? A Sage Intaact blog indicates that RPA has the potential to make many outsourcing relationships obsolete. According to the top four accounting organisations, the costs savings of RPA over outsourcing are around 70 percent. Along with the cost-saving factor, RPA also gives organisations complete control over the automation process, can be scaled to suit demand, simplifies communication and delivers accuracy for rule-based tasks. Do BPO companies and teams fear the onslaught of RPA? The fears are largely exaggerated and Tom Davenport of MIT Center for Digital Business and Deloitte Analytics says that automating types of tasks with a machine may not be earth-shattering, but the early adopters of RPA do seem to have generally achieved some impressive returns on investment. Citing an example, he emphasised in a blog post as to how one telecom company that automated 160 different processes, achieved an ROI that ranged between 650 percent and 800 percent. According to Davenport, the processes that were structured and codifiable enough to move to services outsourcers are the same ones that will be automated. Many outsourcers have realised this and now offer either their own proprietary RPA solutions or “white-labelled” versions from other vendors. Currently, business processes that show a high degree of knowledge and expertise, from radiology to legal document review, are already being partially automated. Will Cognitive Automation Spell The Doom For Outsourcing? Which brings us back to the question — will automation kill the era of outsourcing and what kind of impact it will have on the labour market? Davenport revealed that all automation systems require human involvement in the form of configuration, oversight and maintenance. Also, the role of outsourcers will change in the future where they will have to go beyond mere labour arbitrage. Outsourcing companies will have to provide a range of automation technologies and reskill process and technology experts. Here’s how Davenport puts it — the mere fact that human involvement is required at every stage of the process for cognitive automation indicates RPAs will not make the vast majority of human functions obsolete. Even though BPOs will become less profitable in the future, the technological advancement of cognitive automation will converge, mature and will be augmented by humans. 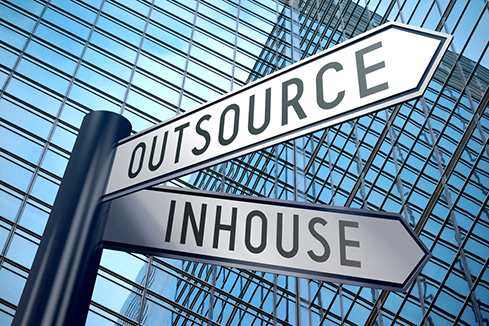 The question that most outsourcing companies are grappling with today is to what extent will this affect the business of offshoring. On the upside, RPAs will enable companies to achieve unparalleled levels of process accuracy and efficiency and at the same lower the cost as compared to the work that can be done by human employees. In addition to this, RPAs can effectively provide activity logs and evidence of how decisions were made, ensuring they meet auditing requirements. Besides, the trend will not just affect a few sectors but will be a global employment and economic trends. In terms of India, where outsourcing is one of the biggest sources of employment in India, this will affect the labour outcome. A research report from KPMG’s Cliff Justice highlighted the shift to RPA is a double-edged sword. It will not only digitise labour with advanced machine intelligence, big data, analytics, mobile technologies and cloud computing, but also hugely impact the knowledge worker labour market. However, a section of economists suggests that RPAs will impact the labour market positively by expanding the job market and created new roles. Source: analyticsindiamag.com-Will Robotic Process Automation Bring Down The Curtain On Outsourcing?